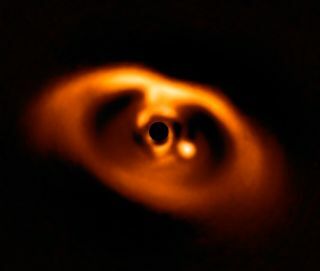 This photo from the SPHERE instrument on the European Southern Observatory's Very Large Telescope is the first clear image of a planet caught in the act of formation, around the dwarf star PDS 70. The planet is clearly visible as a bright point to the right of center, which is blacked out by the coronagraph mask used to block the blinding light of the star. Keppler and her colleagues analyzed new and archival observations of a young dwarf star called PDS 70, which is about 5.4 million years old and lies 370 light-years from Earth. These data were gathered by two instruments on the European Southern Observatory's Very Large Telescope (VLT) in Chile, and one instrument at Hawaii's Gemini Observatory. The observations revealed the presence of a newborn gas giant in PDS 70's surrounding protoplanetary disk. And the team was able to photograph the alien world, known as PDS 70b, using one of the two VLT instruments, which is called SPHERE (Spectro-Polarimetric High-contrast Exoplanet Research). The researchers' analyses suggest that PDS 70b is two to three times bigger than Jupiter and lies about 1.9 billion miles (3 billion kilometers) from its star — about as far as Uranus is from the sun. This image shows the sky around the faint orange dwarf star PDS 70 (in the middle of the image). The bright blue star to the right is χ Centauri. "Keppler's results give us a new window onto the complex and poorly understood early stages of planetary evolution," André Müller, lead author of the second study, said in the same statement. "We needed to observe a planet in a young star's disk to really understand the processes behind planet formation," added Müller, who's also based at the Max Planck Institute for Astronomy.